A new eco-friendly campaign aimed at fighting period poverty is set to run throughout April at Small Changes Wholefoods store in Co Dublin. 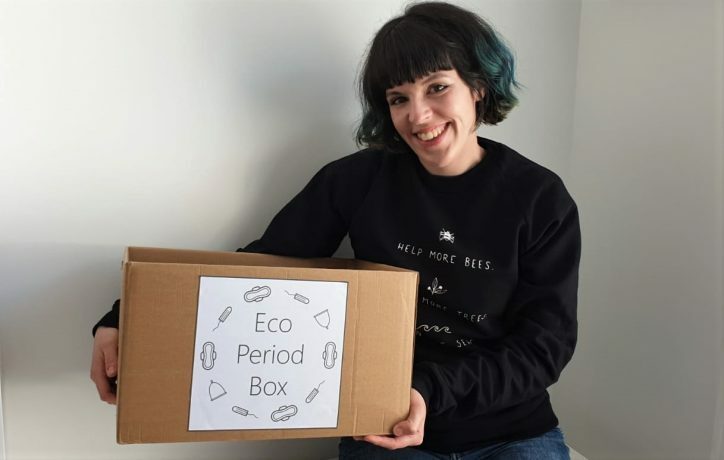 The Eco Period Box initiative invites members of the public to donate an eco-friendly sanitary product to a collection box for those who can’t afford feminine hygiene necessities. Ella Daish, an English environmental campaigner who stated the project, said that her campaign has had tremendous success in the UK with over 4,000 plastic-free period products donated last December alone. Ms Daish said that the overwhelming support pushed her to renew her campaign this month with Small Changes in Drumcondra volunteering to take donations in Co Dublin. She added that she was “saddened” by the notion of women “missing out on their education and opportunities” due to period poverty and decided to do her part in tackling the problem. The average female has her period for over 2,500 days of her life, making sanitary products an essential part of life for women. Nearly half of teenage girls in Ireland struggle to afford sanitary items according to a recent study conducted by Plan International. Speaking to The Green News, Ms Daish acknowledged that keeping periods plastic-free can be an issue for all women since eco-friendly options are more expensive. “Price is definitely an issue, we shouldn’t have to pay more to use an option which is better for the environment,” she said. Eco-friendly sanitary products, including period cups, however, are subject to VAT at 23 per cent. Traditional tampons and sanitary pads are not currently subjected to VAT in Ireland and are among the most common rubbish being found on beaches worldwide. Ms Daish reasoned, however, that a growth in demand for eco-friendly options can help producers to “naturally” reduce their prices. “By more people using eco-friendly products, manufacturers will likely respond to changes in consumer demand by making these products more widely available, which in turn will likely lower prices through increased product competitiveness,” she said. Last month, the Seanad passed a motion on period poverty proposed by the Oireachtas Women’s Caucus that had already been debated in the Dáil. It asks the Government to equip all public buildings with free, safe and adequate sanitary products and to provide a wide-ranging education plan on menstruation. Welcoming the new motion, Lorna Bogue, a Green Party candidate running for election for Cork south central municipality, said that the new motion is not solely about reducing the cost of period products but it recognises a woman’s right to having her period with dignity. A similar initiative, known as Homeless Period Ireland, devised to ease the access of homeless and refugee women living in Direct Provision to sanitary products was also launched in 2016.